I always like to see new natural lines pop up, especially when they are easily accessible and inexpensive. Walgreens has a new exclusive line of healthy house and lifestyle products available called Ology. I tried out the All In One Soothing Baby Wash & Shampoo in Lavender and Chamomile. Gentle and natural formula to cleanse and protect baby’s delicate skin & hair. No parabens, silicones, dyes, phthalates or animal byproducts. Bottle made from 100% post-consumer materials. It smells lovely and on sale for $3.99 – that beats any safe kid shampoo I’ve bought before! The line also contains a Baby Lotion, but the bulk of Ology is cleaning products. Laundry Detergent, Fabric Softner, Glass Cleaner, All Purpose Cleaner, and even toilet paper and light bulbs! All at fabulous prices! Even more important is Walgreens is partnered up with Healthy Child Healthy World with the mission of protecting children from harmful chemicals. “Increasing evidence shows that the chemicals included in everyday products could be contributing to children’s diseases and behavioral disorders, including asthma, autism and cancer,” says Gigi Lee Chang, CEO of Healthy Child Healthy World. Select Ology brand products are available at Walgreens and Duane Reade locations, as well as online at www.walgreens.com/ology. I received a gift card for sharing this post with you. All opinions are my own. 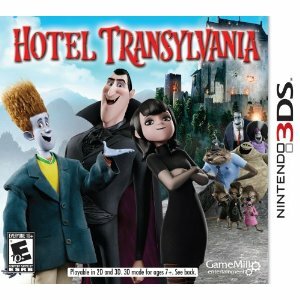 We have not watched the movie Hotel Transylvania yet, but it is definitely on our list to do so! It was the #1 Grossing Movie Ever back in September. Vampires, Werewolves, and Mummies oh my! When my boy’s favorite characters come out in video game form, they neeeed to try it out. Where monsters and their families can live it up, free to be the monsters that they are with no humans around to bother them. Dracula’s beloved daughter Mavis is turning 118 and Dracula has invited a few of his closest friends: Frankenstein and his wife, the Mummy, the Invisible Man, and the Werewolf family to Hotel Transylvania to celebrate her special day. Catering to these monsters is a delight for Dracula, but everything could change for the overprotective father when one ordinary guy stumbles through the hotel and takes a shine to Mavis. Play through a wide variety of spooky locations, solving tons of puzzles and battling tough bosses in this side-scrolling, action-packed adventure! The Nintendo 3DS has awesome graphics with popping out images and I love when a game makes them think instead of just act. Monster fun? oh yeah! I know my boys will have a spooktacular time! Have you seen the movie yet? Do you have a favorite 3DS game? I was sent this game for my post and all opinions are my own.